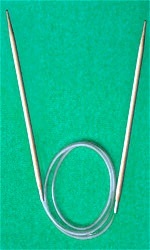 Circular needles in stainless steel and bamboo in two lengths: 23cm and 100cm. 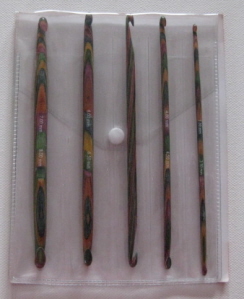 These multi-coloured, wooden needles are beautiful to look at and wonderful to knit with. 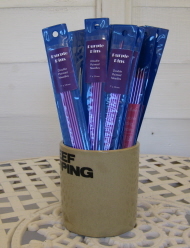 Set of five double-pointed crochet hooks made from laminated birch wood, stored in a clear case with five pockets and a handy popper fastening. 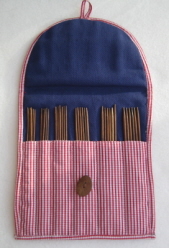 The needles are made from ethically and sustainably sourced Sheesham Wood (a member of the Rosewood family). 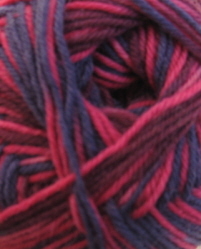 They have sharp, gradually tapered points and a smooth surface for effortless knitting. 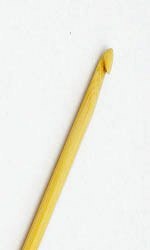 The bamboo dpns are strong and durable with gradually tapered points and a smooth surface for easy knitting. Smaller sizes (up to 4mm) have 6 needles in each set to compensate for unexpected breakage. 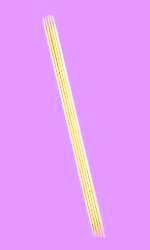 Pointy sticks are sets of 5 double pointed needles made from bamboo. The needles are 15 cm long. 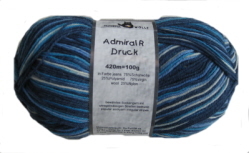 60 cm, 80cm and 100cm lengths are currently in stock and 120cm length is available on request. These hollow stainless steel needles are as light as bamboo but incredibly strong. With flexible cables and perfect joins they glide like a dream! 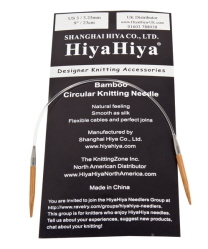 These bamboo needles are strong and durable with gradually tapered points and a smooth surface for easy knitting.